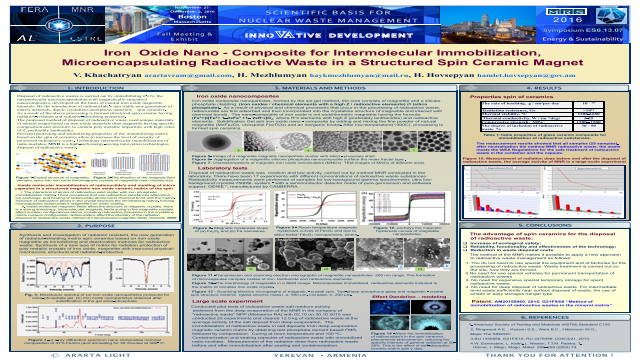 Abstract: Disposal of radioactive wastes is carried out by immobilizing it’s by the intermolecular microencapsulation with magnetically structured nanocomposites, developed on the basis of natural iron oxide magnetite minerals. By the introduction of radionuclide’s into stable new generation of matrix materials, dipole crystalline-amorphous materials – spin ceramics. As a result of the above processing is formed structured spin ceramic having radiation-resistant and radiation-absorbing properties. The proposed method of disposal of radioactive waste, used unique materials of natural origin based on iron oxide materials titan magnetite having specific composition and structure, to contain poly metallic impurities with high value of Z, preferably lanthanides. Elevated protecting and neutralizing properties of the immobilizing matrix based on the spin of ceramics allow to increase the level of security of processed radioactive waste. Technology intermolecular immobilization of radio nuclides, MNR is a high-tech energy-saving innovation technologies disposal of radioactive waste. Reduction in waste disposal costs.